MITZPE RAMON, ISRAEL–Our final stop of the final day: Mamshit. Above you see some of the ruins of this city east of Dimona and a short distance west of the descent into the Dead Sea Rift Valley. The highest structure is the “guardhouse” (which overlooked a reservoir) and the lower on the right is known as “the wealthy house”. All the other rocks you see are remnants of mostly homes and other dwellings. 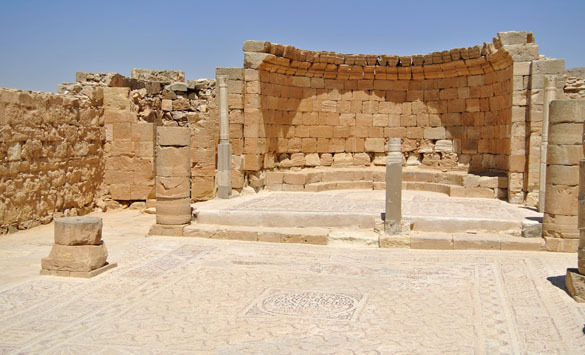 Mamshit was established by the Nabateans as a station along the Incense Route around 50 CE. Most of the primary buildings were constructed in the Second Century after the Nabatean Kingdom became part of the Roman Empire. As a trading city it flourished until the Seventh Century when either the Persian (614 CE) or the Arab Invasion (636 CE) ended its importance and it faded away. Today we toured it for about an hour and we were the only people there. From the Guardhouse one of the three Mamshit dams comes into view. These were the most critical structures in the settlement because they captured the winter runoff in reservoirs that could be used throughout the dry summers. The area behind this dam is now completely silted up. There was a British police post at this site in the 1930s and 1940s running a series of patrols on camels. The Brits rebuilt the dam for their own use. This is a lavish church (the “western church” or “Church of St. Nilus”) in Mamshit. Beautiful mosaics are still preserved on the floors. 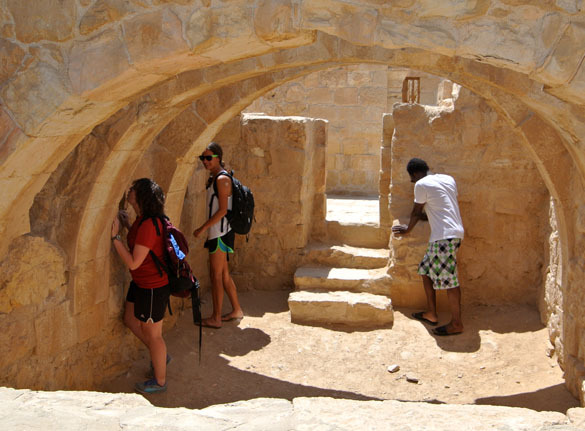 The Wooster students are her exploring one of the grander houses built in the Second Century. 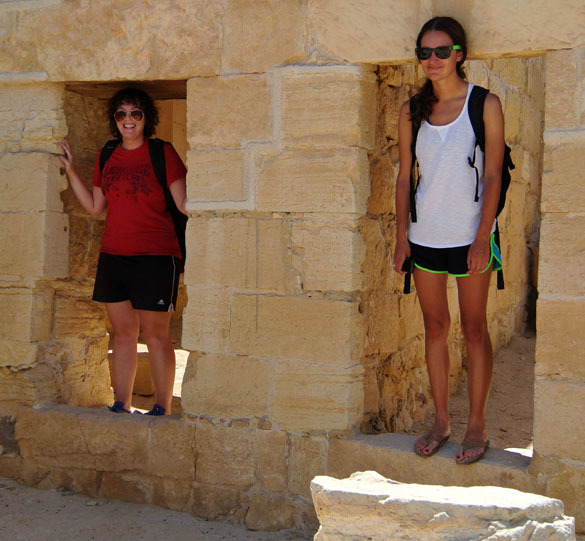 Steph and Lizzie are using the doorways to estimate the likely heights of the residents. Looks like they were more Lizzie size than Steph! This was a suitable place to end the Team Israel 2013 expedition: a location where geology, archaeology, history and culture are combined in ruins still open for interpretation and study. Now we have one more night before departing early in the morning for the airport in Tel Aviv. We appreciate this opportunity for travel and research very much! Oscar Mmari was there as well. His style was a bit more relaxed. He was no doubt pondering that the amount of bromine in these waters (at 4.2 g/kg) is the highest anywhere on Earth. 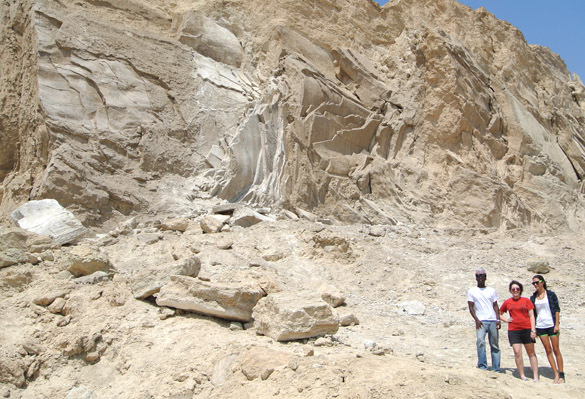 On the way to Ein Gedi we stopped by the famous Mount Sodom — a mountain of salt. This is a famous salt diapir, or a salt dome that has reached the surface. The layers of salt here are vertical because of deformation caused by the upward movement of the material. The salt, mostly halite, moves up because it is less dense and more plastic than the overlying sediments. This is a close view of the salt layers. 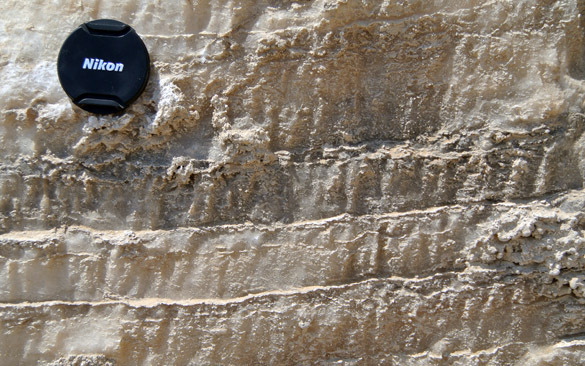 It is very difficult to distinguish original sedimentary layers from planes developed by shear stress. The spot we briefly explored is underneath a jointed block of salt referred to as “Lot’s Wife”. Remember her? 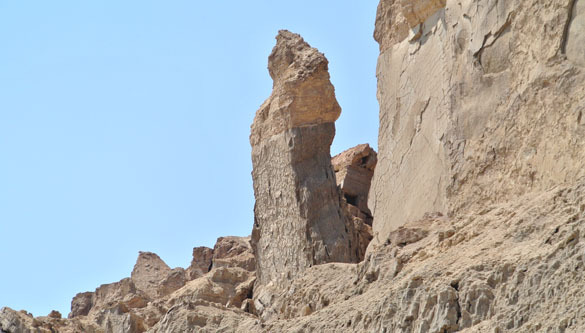 In Genesis she looked back at the destruction of Sodom and was turned into a pillar of salt. If this is her she was about 60 feet tall.